If I had to choose two style essentials that I really can't get enough of this season they would undoubtedly be leopard print and velvet. The two just seem to be absolutely everywhere at the moment and I keep finding new variations of ways to wear them (which isn't doing anything for this newfound obsesh!) But, you know, what’s a girl gonna do? Next very kindly offered me the oppertunity to put together a look for my autumn capsule wardrobe and I really wanted to find pieces that not only made me feel incredibly comfortable but also represented my own sense of style. 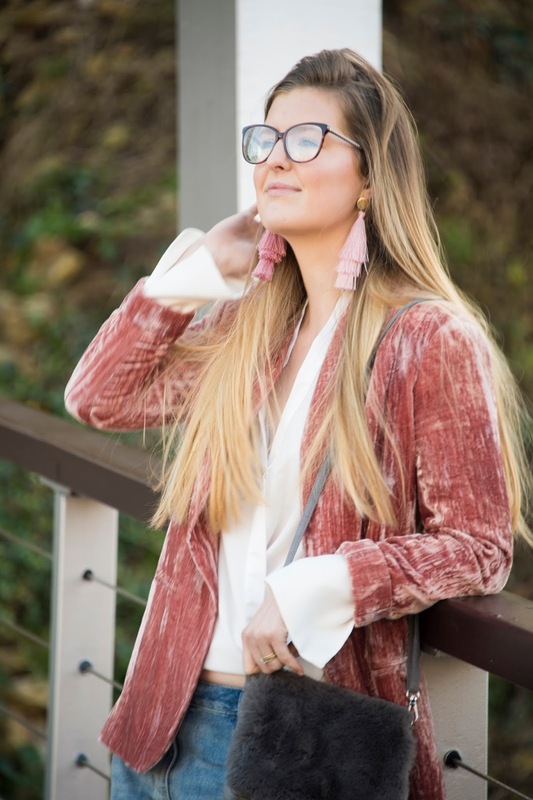 You'll understand why I couldn't pass up this gorgeous blush pink velvet blazer then? 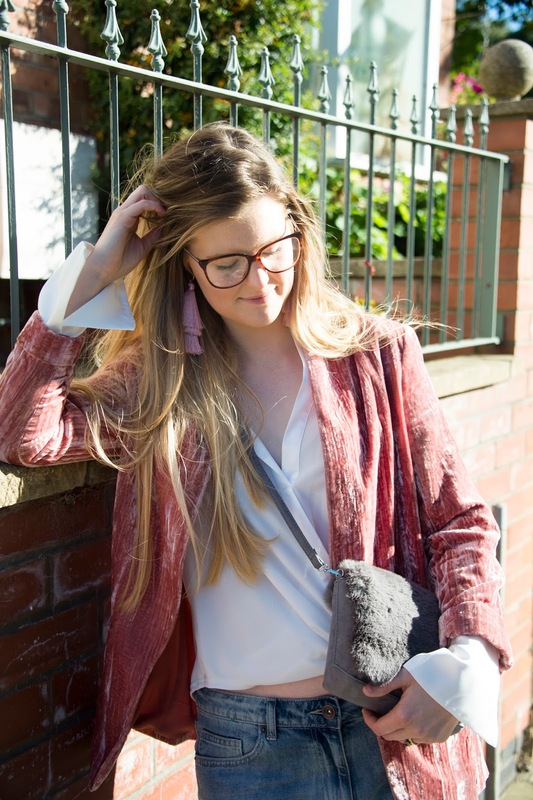 Honestly, I don't know whether to start with the fact it is pink, or the fact it's made of velvet but it is my idea of blazer-heaven and I am seriously head over heels for this piece. 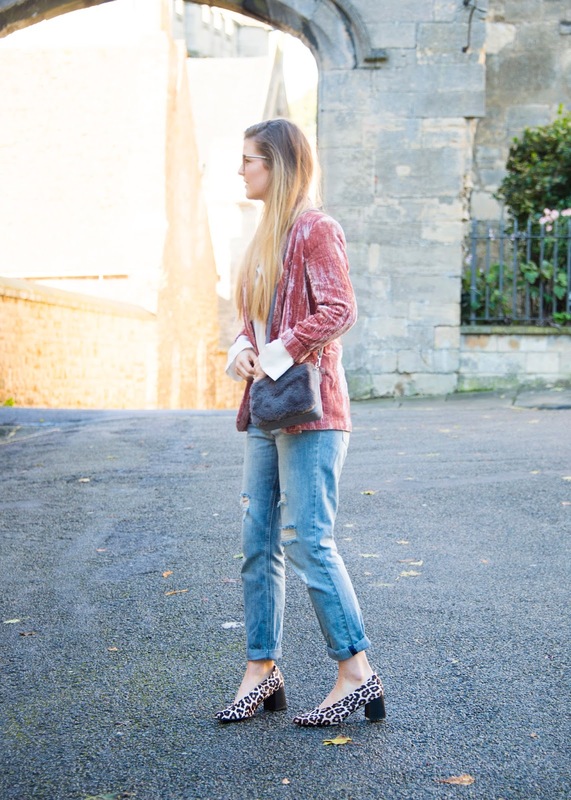 I really love the soft, feminine quality of the velvet against the slightly rough boyfriend jeans. It creates a kind of mismatched, eclectic look which has that ‘just threw something on and ran’ vibe I so love. Effortless and low maintenance- kinda where my perspective on fashion lies anyway. 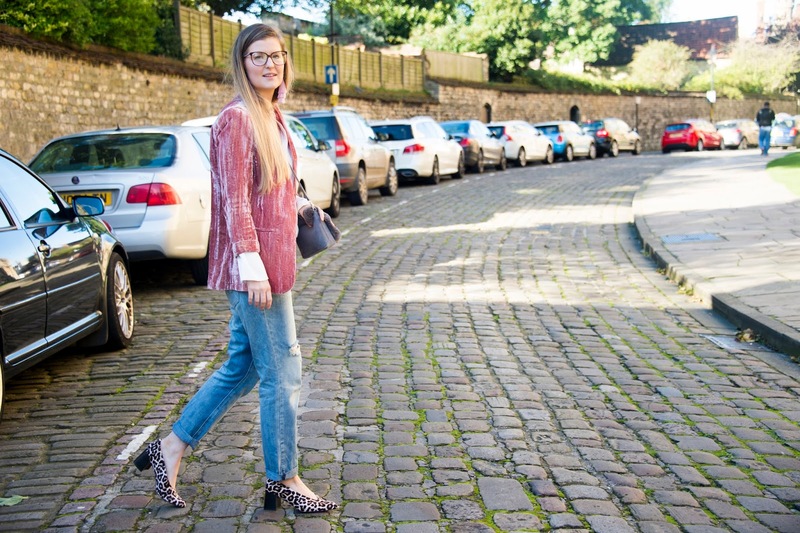 It's workable for so many occasions and with the right shoe and accessories, I feel this look goes to show that a humble pair of jeans can be transformed into a far more 'put together' ensemble. I was also on the hunt for a pair of block heels this season that I could wear specifically with 'boyfriend' jeans to create a bit of a twist on a more masculine denim cut. I found this pair in the Next catalogue a while back and just kept coming back to them. You know when you just lock eyes on something you've been envisioning for ages? Well, these shoes were exactly that for me and try as I did, I just couldn't ignore them. They really are lovely to wear and what's more, the heel height is perfect for creating a little lift but with all the comfort of a flat. Honestly, I've been marching up and down Steep Hill in Lincoln in these and, if any of you know that famous street, you'll know how much it says about a shoe you can manage to wear without keeling over in! 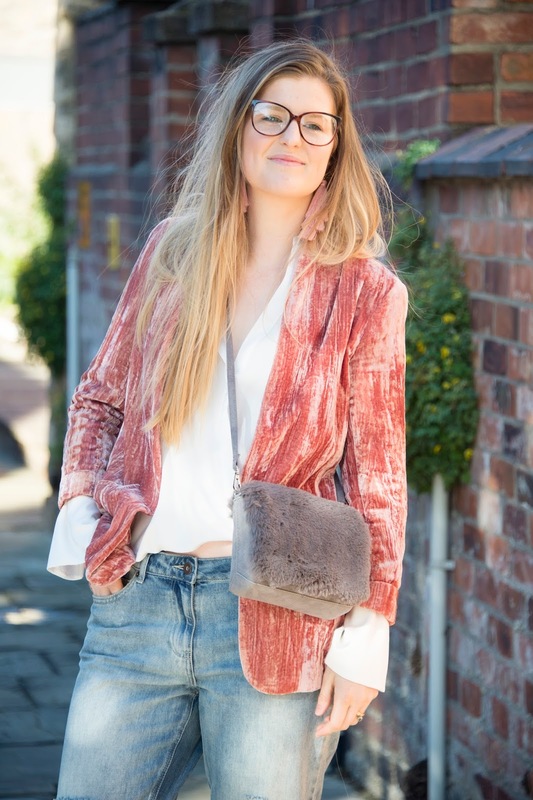 The blazer really does juxtapose the ripped denim and simply oozes luxury in the buttery softness of the velvet and gentle colouring. It totally complements the silky wrap blouse that I also chose for this look and I think together they infuse the outfit with femininity. Honestly, what I love most is that this look doesn't necessarily conform to the way one might expect to style these pieces individually, but combined, I just think they make the outfit come alive! My sense of style has undoubtedly changed a lot this year. I feel braver than ever to wear what I want to and simply having that mindset has liberated my approach to fashion altogether. And you know what, I am loving this phase! I might look back in years and think to myself 'what on earth was I wearing?!' But at least I'll know I was having a ball of a time experimenting and getting to channel creativity into the way I dress. 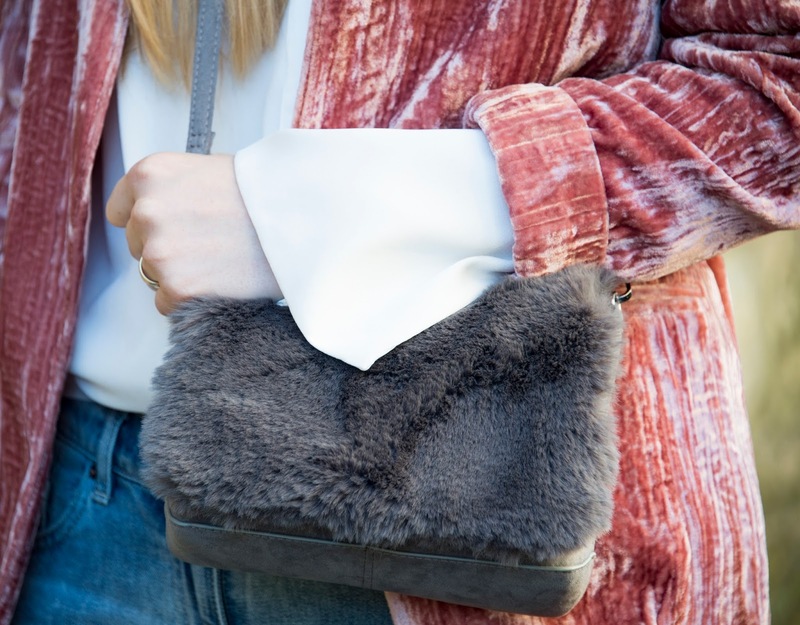 What pieces would we find in your autumn capsule wardrobe? *Post in collaboration with Next who gifted these pieces.